In this, her seventh book, Janice Madden shares with us, her readers, stories which are rich with the vivid and concrete details of her memories of particular places, people, animals and things. And there is no denying the stories are told with a touch of laughter and a sense of gentle irony, by someone who delights in words. Yet through the particular focus of each story, it is possible to discern the theme that unites them all. What is The Red Carpet ? Janice's stories tease into life for us the threads of love that have been woven into the fabric of her own life experiences and help us to understand the mysterious power of love to link human beings across generations, continents and cultures. 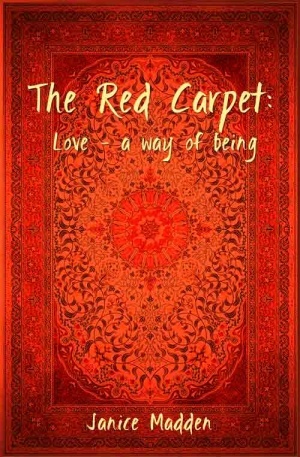 In The Red Carpet, the reader may ask whether such a magnificent story is a fairytale, yet it is real. Janice unravels her true adventures with a soothing flow of words, a splendidly balanced inclusion of fact, and a complete command of the broad narrative structure. But within the words we have much more - a window into the author's passionate, energetic, colourful and joyfully loving mind. Janice displays striking empathy towards immigrants who are effectively forced into silence - perhaps at times for the sheer sake of retaining their perceived sanity - about their atrociously difficult past. This empathetic glow is so clearly sincere throughout the work, and well portrayed in the writing, that it becomes infectious to the reader. Genuine warmth, interlaced with intelligence and irony, is also written into each scene, and to have all of this formulated within an artfully constructed work is indeed a treasure.